Comfort food is typically associated with good ole mac+cheese, or mashed potatoes with gravy. 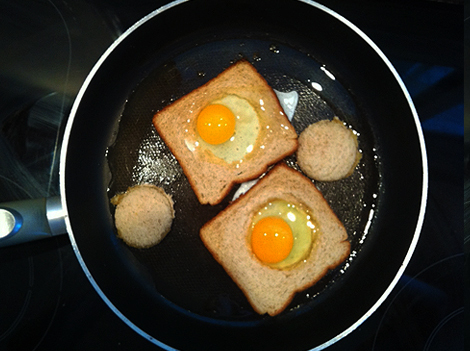 But for me, nothing hits the spot quite like Birds in a Nest: eggs over easy cooked between the thighs of a fresh piece of bread. My mom, aka Lauren B. (the #1 commenter on Tessa’s Homemade), used to make me this dish on special occasions – my birthday, when I had the flu, if I had to get a shot at the Pediatrician, etc. I have spent my adulthood attempting to master this dish, and here it is. Coat your non-stick frying pan with a solid layer of olive oil, and place it on the stove over medium – high heat. Once the olive oil is HOT, add the bread to the pan. 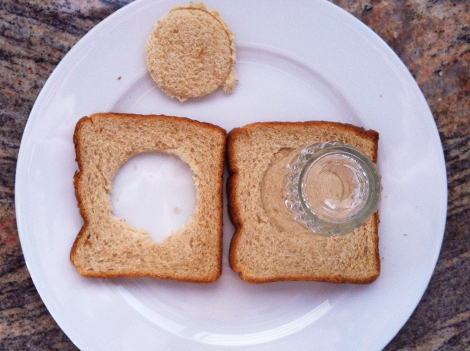 I like to toast up the removed bread circle as well. The bread will first soak up some of the oil, and then will start to turn a lovely golden brown color. 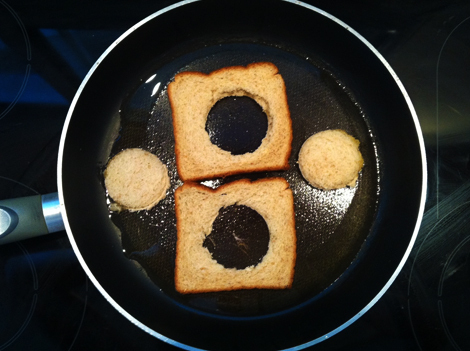 If your bread looks like it is starting to burn, add more oil to the pan. Once the bread has achieved a nice base tan, crack an egg directly into its empty middle. You should immediately hear the egg start to sizzle. Once the egg whites start to appear, well, white, and it’s strong enough to survive separation from the pan, very carefully flip the egg-filled bread. 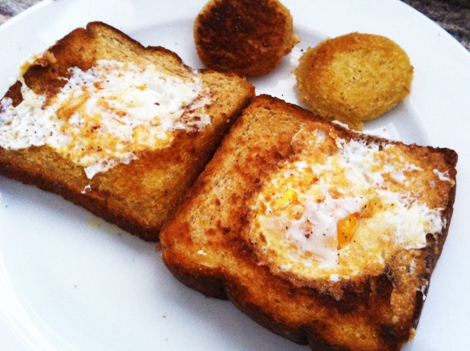 The egg yolk should still be very much runny at this point; don’t break it or you’ll die. Let the underside cook just a little bit – a minute or less? – so that the rest of the egg whites cook while the yolk remains fairly fragile. 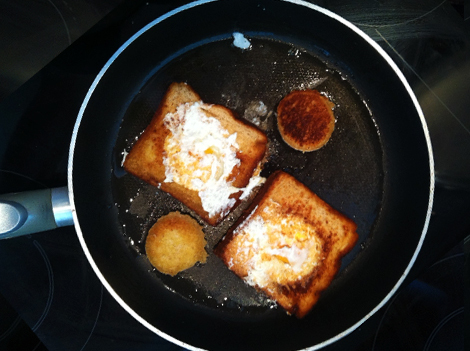 As soon as you’re certain you won’t get Salmonella, nimbly transfer the eggy bread off of the pan and onto your plate. Sprinkle with salt and pepper. *I WISH I had snapped a picture of the runny, gooey egg delight, but I ate it too fast :-(. I will update this post with a runny pic next time. Sorry. This is the yummiest breakfast. And the kiddies LOVE it. It’s the name that first gets them going and the delicious bites that reels them in. For some added color and zip, sprinkle a dash of powdered cayenne pepper on top! YUM!!! I used white bread and omitted the egg. So delicious, thanks!